Premise: Adam Dalgliesh, P.D. 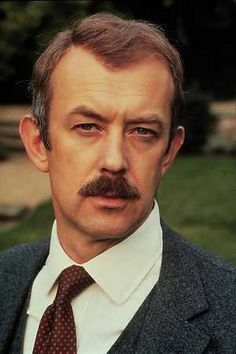 James' intellectual, poetry-writing Scotland Yard detective, first appeared as a Detective Superintendent in 1983's Death of an Expert Witness. This seven-episode case involves a murder investigation at an isolated forensics laboratory. In the final episode, in a somewhat jarring and brief scene, we learn that Dalgliesh's wife Jean and unborn son died during childbirth. Dalgliesh (Roy Marsden) is methodical and introspective, though he can turn on the charm with a quick smile and women often find him attractive. Over the years, he progresses to Detective Chief Superintendent and finally achieves the rank of Commander. His only relative is his Aunt Jane, who bequeaths him a cottage, converted from a lighthouse, on the coast of Norfolk. He spends some time there and becomes involved in a murder investigation in Devices and Desires (1991). Running Time: The running times vary greatly. Some cases consisted of up to seven 50-minute installments, while 1993's Unnatural Causes was a 103-minute movie. Status: Ten cases were broadcast between 1983 and 1998. They're all available on DVD in the U.S.
Production Notes: Phyllis Dorothy James--best known as P.D. James--introduced DCI Adam Dalgliesh in her 1962 novel Cover Her Face. Over the next four decades, she wrote 13 more Dalgliesh mysteries, with the last one being The Private Patient in 2008. The first twelve were adapted for television, with Roy Marsden starring in the first ten and Martin Shaw (George Gently) playing the detective in a later series consisting of two two-part episodes. The cases in the TV series appear in a different order from the books, which explains why Dalgliesh is introduced as a Detective Superintendent instead of a DCI. Our Review: Dalgliesh is unique in that some of the mysteries take over five hours to unravel over multiple episodes. Its length provides more time for character development and also more complex plotlines. Some of the show's critics have complained about slow pacing, but we found the stories to be absorbing and the settings ideal for homicide (e.g., a hospital, a nursing home). Roy Marsden is well-cast as Dalgliesh, coming across as professional and very much in charge (he uses his commanding voice to great effect). Some of the plots vary from the P.D. James novels, but they still reflect the hidden desires and dark secrets that drive her murderers.